A range of spherical* flasks from semi-micro to pilot plant scale fitted with large diameter flat flange joints. 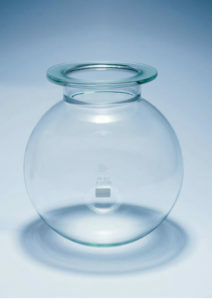 This design has several advantages over conventional conical jointed flasks. *FR700F is cylindrical shaped and fits a 500ml heating mantle. A series of multi-socket lids for use with the Quickfit range of wide neck reaction flasks and culture vessels. They allow introduction of a great variety of standard Quickfit equipment for stirring, temperature measurement, aeration and general distillation procedures. The parallel side neck can be fitted with a multiple adapter so that larger dropping funnels can be used. Lids with a single socket neck are of use where simple extraction, refluxing or mixing only are required. To fit vessels with flange bores as indicated. Subscribe to receive product updates?